Lightweight prospect Mark Bernaldez (W18 KO12 L2 D0) scored a big win in the US dominating veteran German Meraz in their eight rounder fight. Judges scored it 80-72, 79-73 and 78-74 all in favor of Bernaldez. The fight was held Miami, Florida and was organized by MR Promotions and William Ramirez. “Meraz was still strong but I came in prepared for the fight. I am so grateful to the promoters and to Sanman for such a great opportunity fighting in the US. 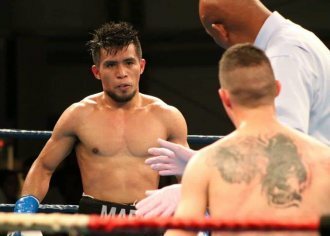 I look forward to fight here more”, Bernaldez stated. Meanwhile Sanman’s rising welterweight prodigy Adam Dio Abdulhamid (W14 KO6 L7 D0) Prell Tupas wasted no time and knocked out Prell Tupas in the very first round. The younger Abdulhamid looked sharp and strong and came out looking for the kill upon the opening bell. The fight was held at Resorts World Manila. Sanman CEO Jim Claude Manangquil was happy with the performance of both boxers. “It was another great day for Sanman Promotions as two of our rising stars scored big wins. Both of them will be getting bigger fights. They are on the right track in their careers,” Manangquil said.